Using templated shapes to generate diagrams increases your productivity and using color and icons increases the effectiveness of diagrams. So read on if you want to hear more about that. Every organization has software applications, applications in short. And all of these applications support the business processes in processing and storing information. But applications also cost money, get out of date and may have trouble interfacing with each other (for instance because of different types of application platforms and technology). Because applications do age and get old, it is important to manage the applications by keeping an overview of them. Doing that only makes sense if you create an overview that gives valuable information on which you can decide which applications you have to replace, remove or new ones to introduce. As you probably already know Dragon1 Innovation Lab can be used as an online EA tool to create Application Landscapes with. But what you might not know is that in the Visual Designer of Dragon1 Innovation Lab you can create and work with Templated Application Symbols. Here you see a screenshot of the Visual Designer with an instance of the default templated shape for Application selected. A Dragon1 Templated Shape is a shape that consists of visual elements that can change of size, color and visibility based on attribute value or other filters. For an organization, human, product, service, process, application, database, client, server and network default templated shapes are available. Dragon1 makes use of SVG, the Scalable Vectors Graphics standard, so you can create and use predefined and new defined shapes easily. Screenshot of the Visual Designer showing a default available SVG Application Template Shape. As you see in the Application Landscape snapshot-figure below there are applications with different colors. Some of them have a symbol inside them and all of them have different colors icons. Every icon tells a story about the status or value of an attribute of the application (like cost, ownership, etc...). This can also be a computed value. In this example snapshot you see some applications turn green (when they have no outstanding issues), the blue house icon means the application stores GEO data, the blue person icon means the application stores client data and the red colored wrench icon means service management data is unknown for this application. If the application has a department symbol inside it means it is a mission-critical business application. 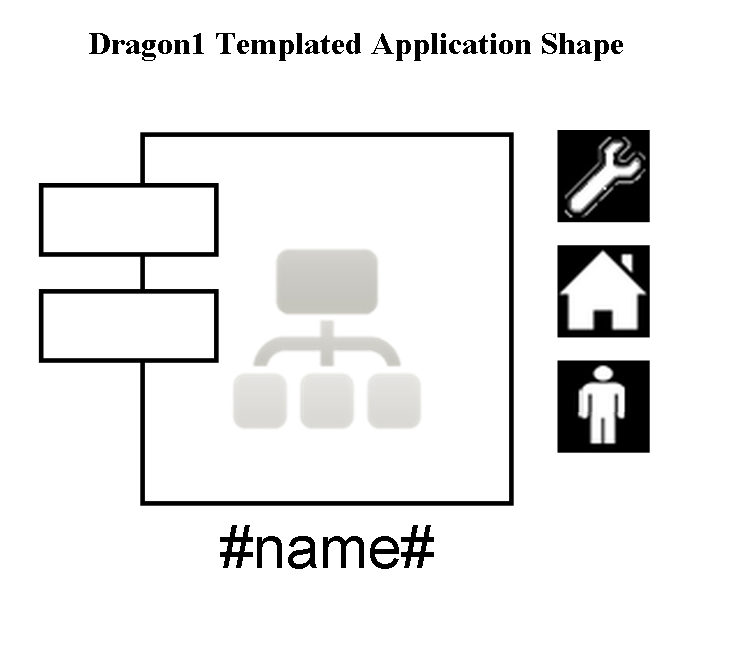 Snapshot of an application landscape using the default template application shape on Dragon1. Now this is a very powerful way to give meaning to the status of the applications in your landscape: You can take decisions in this way! The icons, the inside symbols and the colors, are just examples of what you can do. You can design and choose whatever icons for application-attributes you like and create your own templated application shape with it. Below you see the Architecture Repository web application of Dragon1 Innovation Lab with some applications entered as data. It is this data that we will use generating an application landscape with. In the repository the data is connected into an application model. And every application has certain attributes (like name, costs, ownership) filled in. Enterprise architects usually work with EA Repository tools like this to store and relate all entities of an organization with eachother. This EA Repository is unique because it's online and enables you to define meta-meta models, so you can work with any approach, framework or method, inside and outside the field of enterprise architecture. Screenshot of the Architecture Repository showing imported Software Application Data. In the Visual Designer you can create and view models, views, viewpoints and visualizations. Screenshot of the Visual Designer showing a model based on the imported Software Application Data. A model like this is not useful for taking decisions. It only tells there is a certain relationship between entities. Nothing more. In order to have a visualization of data or model that is meaningful to support decisions, we need shapes that interpret and visualize application attribute values. For that we use the templated application shape. Next we show the view, a filtered version of the model. Only the entities, attributes and relationship we want to show on the visualization are needed to let through. The rest of the data, in this case the organization entity, is hidden/filtered out. Screenshot of the Visual Designer showing a view of the model, filtering out the organization. Below you see a screenshot of the Visual Designer which has generated the application landscape using the data from the repository. The landscape could also have been drawn completely by hand. But generating a landscape save a lot of time, and has immediately been updated when the data in the model changes. Screenshot of the Visual Designer showing a generated application landscape using the Templated Application Shape. This visualization is usable to support decisions with. If you want more information Dragon1 Innovation Lab using it as EA Tool to create or generate application landscapes like this, you can contact me directly via mark.paauwe@dragon1.com. Application Rationalization: How To Compile a list of Apps to rationalize?